Live broadcasts are a real crowd puller for your event. Put your live case on the big screen or stream your presentations into the World Wide Web. No matter if you have twenty people sitting in your seminar room or 2000 people at your international congress. We provide all kinds of audio-visual equipment and our professional staff guarantee your event runs smoothly. Our conference networking solution ConfNet gives your congress the certain third millennium upgrade. We are your one stop for abstract management, ePosters, eLearning, voting, apps, and much more. – web cast your press conference, congress, etc. – web casts your press conference, congress, etc. We can broadcast your press conference, meetings or presentation. 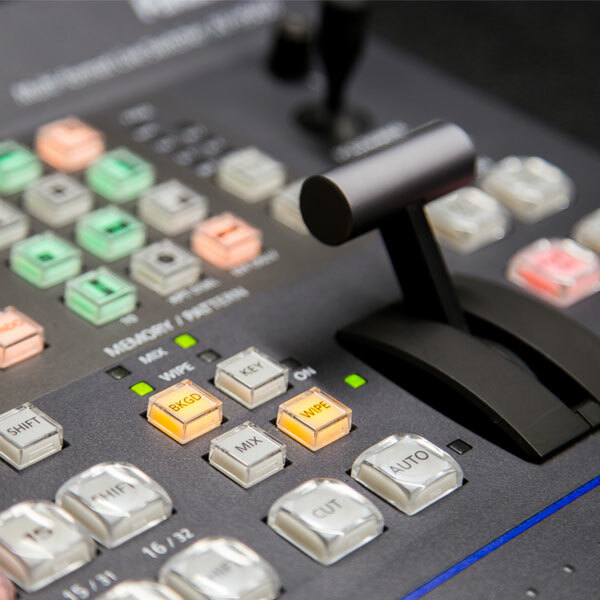 We provide everything you need – microphones, cameras and outside broadcast vans. As we are specialised in broadcasting medical surgeries and examinations, our team of fully professional camera men, directors and video operators will guarantee best video results without any interferences to the procedure. If you are looking for an alternative for live broadcasting, why not put your live case in a box and present it afterwards to your audience. We will record the case for you, cut the video clips in compliance to your wishes and put it on the screen without any loss in quality. Of course, we can produce any other video clip for you: product info, trailers, documentaries etc. Your event live on the internet. We can put your video on our streaming server in order to broadcast it live or as video on demand to watch it afterwards. Your internet audience can also participate in your event by using our ConfNet apps for “ask the speaker”, “place a vote” or “evaluation”. We also have an OB van that can not only transmit and receive HD video streams. It can also put up an internet connection everywhere you want by linking up to a satellite via IP, for videoconferences or other internet related purposes. Let your congress’ participants use their own smartphone instead of inconveniently handing out devices for voting etc. 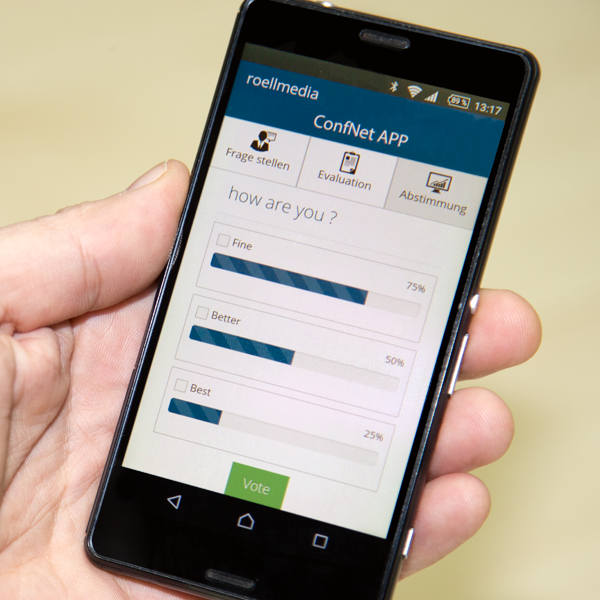 Our mobile ConfNet app can be used for voting, sending questions to the panellists or evaluate a talk. You will see the results instantly on the screen or detailed as xls-file. ePosters will give you the opportunity to present multimedia content on a poster using LCD screens. That is saving money for exhibition space and printing. Participants can skim through all posters our by using keywords or watching everything on one topic. 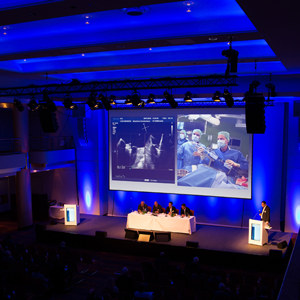 As all posters are present as a data-file, they can be uploaded in advance, be edited on the congress, be presented in the main lecture hall for awarding a poster or be provided on the congress’ webpage as a download. Use our media check or speakers’ ready room for sending the presentations to the lecture halls, instead of connecting laptops and USB-sticks for every talk. Speakers can use our html based preview and start their presentations themselves just by clicking on a thumbnail with their first slide and their name on it. Our technicians will assist the speakers with presenting videos, animations or all other media. For your scientific syllabus you need a detailed overview of all applications for talks, sorted by topics and presentation type. Applicants can upload their preliminary talk directly into a database in order to make filtering, evaluation and ranking easier. Even when you are in a place where internet connection is not sufficient, we can use our IP-SNG or mobile system to establish a stabile broadband internet connection up to 10Mbit up/down. This connection tape works isolated from utilization of mobile LTE or UMTS or landline networks. Thus we can guarantee a certain up- and downstream for event.